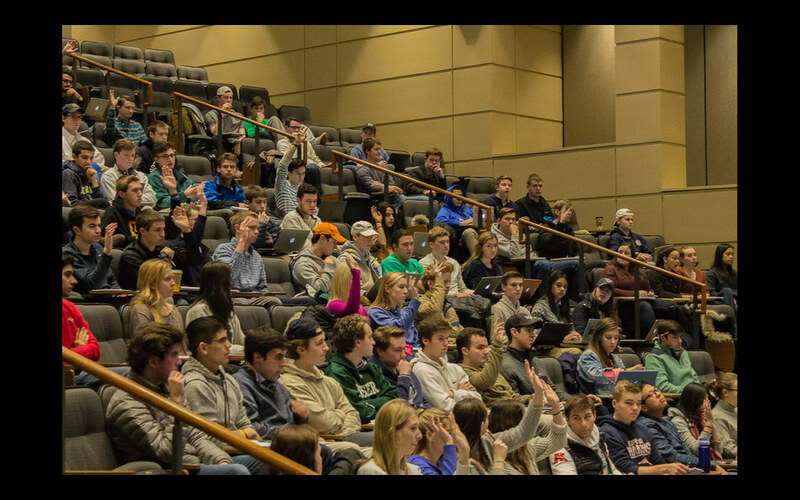 On Feb. 3, close to 250 Notre Dame students from various majors participated in an Investment Banking Crash Course sponsored by the Notre Dame Institute for Global Investing (NDIGI) and the Wall Street Club. This crash course was led by junior Finance and Theology Major, Billy Barth, and junior Finance and Political Science Major, Sean Dedrick. Not only are Barth and Dedrick student-athletes, they also have had successful recruiting experiences in investment banking as they have been offered investment banking internship offers from William Blair and Bank of America, respectively. These students used extracurricular time to create a four-hour long workshop to provide information to students interested in investment banking and finance since the recruiting process for these positions are among the most complicated to navigate. This process traditionally consists of at least three or four rounds of interviews, with each round of interviews becoming increasingly more challenging. Having already gone through this recruiting process, Barth and Dedrick wanted to help their fellow students effectively prepare. The second portion of the workshop focused on financial modeling and was led by Will Lederer, a senior Finance and Political Science Major who will be working for Blackstone post-graduation. Lederer provided an overview of modeling techniques for examining discounted cash flow (DCF), which is widely used by investment bankers to estimate a company’s value, and leveraged buyout (LBO), which is typically used in private equity investing. Lederer walked through the mechanics of these models in order to set a foundational understanding for the following Saturday workshops that will more thoroughly cover the DCF (February 10) and LBO (February 24) models. These workshops will be conducted by industry practitioners and supported by members of the Wall Street Club. By fostering peer-to-peer leadership and utilizing the knowledge of experienced students such as Barth, Dedrick, and Lederer, NDIGI is able to assist in building undergraduate communities centered around career aspirations, especially for students interested in investing and financial services.